Sometimes I am really good at writing reviews for books that I read and think, “I need to review that.” And other times… well… I read Dragon’s Curse by H.L. Burke over a year ago… and am just now getting around to talking about it. Sometimes reviews are just daunting to write. However, I want to be better about 1) reading books by other indie-fantasy authors, and 2) reviewing those books, because I know from experience that the encouragement of a good review can be priceless beyond measure. It may not help sales, it may not boost anyone’s rank on amazon (don’t believe all the memes you read…. reviews of books on amazon don’t really do a whole lot), but it can be a much-needed pat on the back for an author who might need it because they’re feeling as though perhaps it would just be better to throw in the towel. Not that I think this author deals with that. Also, I’m discovering that I actually quite prefer indie authors these days. Their stories tend to do more unexpected things, and don’t slog through the middles as much as some of the more popular traditionally published works. Perhaps this is because they don’t get scrunched into the “formula” that publishing houses are trying to follow, or perhaps it is because indie authors feel less able to spend thousands of words on anything that might be deemed “boring” (such as sitting around being besieged and arguing about what to do about it, like some popular fantasy story I know of… or a certain author whose massive series sort of meandered a bit from books 7 – 10 before it “got good” again… ahem, ahem). Anyway, whatever the reason (his heart or his shoes), I am massively enjoying getting to read some marvelous books by fellow small-pub and self-pubbed authors these days. And Dragon’s Curse was one that I enjoyed rather a lot. See what I did there? Transition! H.L. 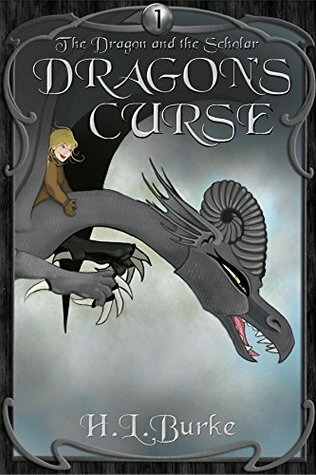 Burke’s Dragon’s Curse is the first of a four-book series called “The Dragon and the Scholar.” And although I’ve only read book 1 so far, this is a series I am very interested in reading the rest of and owning. A fun, fantasy romp with a hint of romance, I very much enjoyed the story. The main character, Shannon, is not your typical fantasy maiden. She is not a princess, nor is she a down-trodden orphan searching for her parents, nor is she an overlooked handmaiden. No, she is a scholar. A no-nonsense, pragmatic, scholar. And an extremely good one, at that. She has studied and worked hard, and when a prestigious assignment comes available, she does everything she can to persuade the powers that be that she is the right candidate for the job, even though it’s her first actual field assignment. This is a clean fantasy read that I would recommend for ages 13 and up – I would say younger, but the unwanted attentions/words of the knight character towards Shannon might be a bit too mature for some readers. Overall, Four Solid Dragon Eggs. Great review! I’m even more intrigued to read this one now! Just need to find the time… And interesting thoughts about Indie books being more original/unexpected. Very interesting… I just read somewhere that although Diana Wynne Jones was traditionally published, she did her own editing and didn’t let anyone else edit her books, which… also might be in favor of your idea of Trad publishers squishing stories into traditional models. DWJ is about as far from “normal story structure” as you can get. XD …Random sidetrack (DWJ has been much on my mind of late. Anyways, thanks for the review! I’d been planning on reading Dragon’s Curse, but your review just bumped it up a few notches now that I know what I’m in for and am more curious about it! I did not know that about DWJ, but it makes sense. The more I read indie-authors, the more I notice how “rote” trad-pubbed books seem to have become. There are definitely authors (even current, still-writing authors) who break that mold, but they seem harder to find, somehow. I have been quite enjoying your posts on DWJ lately. I’m sorry I haven’t been commenting much, all my mental-capability-for-writing seems to be going into this rough draft I’m churning through – so I haven’t been as commenty on blogs I love lately. But I have been reading, and enjoying! No worries! That does mean a lot that you’ve been reading/enjoying, so thank you! But that draft writing is more important at the moment, so GO FOR IT! On the topic of traditional publishing vs. indie publishing, have you done any posts on your thoughts on the advantages vs. disadvantages of these publishing methods, or would you be willing to do one? I ask because I’ll have to make that decision someday myself and I really like seeing a variety of opinions. I’m currently leaning towards traditional publishing because I very badly want to see my own words in physical print, which, due to money matters seems more likely to happen through the traditional route. I’m also not sure I fancy having to shoulder all the costs of self-publishing, not to mention the burden of being responsible for all my own marketing. (I have to market my own Etsy shop and often feel I stink at it.) But then, I worry that a trad-pub might try to stuff me in a formulaic little box, Or do you think it’s possible that those authors who get so formulaic put *themselves* in that box because they think they have to? Anyway, I would like to know your feelings on the matter if you don’t mind sharing. I do not recall if I’ve ever done a post on indie-vs-trad publishing. Probably because I don’t feel super-qualified to write about the pros/cons as I’ve never actually done the trad-pub thing (the closest I got was Five Enchanted Roses). I’ve heard from a lot of other authors on the subject though, so I could try to take a stab at it… let me ponder it for a bit. “Shannon is a blunt, somewhat scatterbrained, but very capable character, and an excellent foil for an extremely sarcastic dragon, who oddly shares her deep love of books. ” That sounds like a fun combination. I also like the idea of a scholar as the main character.